Although tibial plateau fracture was originally termed a bumper or fender fracture, only 25% of tibial plateau fractures result from impact with automobile bumpers. The most common mechanism of injury involves axial loading, such as results from a fall. Other patterns of injury result from laterally directed forces or from a twisting injury. In all cases, force is directed from the femoral condyles onto the medial and lateral portions of the tibial plateau, resulting in fracture. In younger patients, the most common pattern of fracture is splitting, while in older, more osteoporotic patients, depression fractures typically are sustained. Tibial plateau fractures. 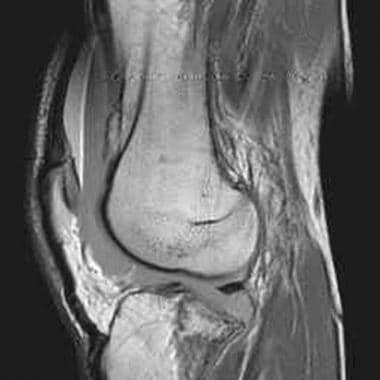 MRI of the knee in a patient with tibial plateau fracture and lipohemarthrosis. Three layers of effusion are demonstrated on this proton density sequence: fat, red blood cells, and serum. Low-signal intensity in the tibial plateau corresponds to the site of fracture. Tibial plateau fractures. 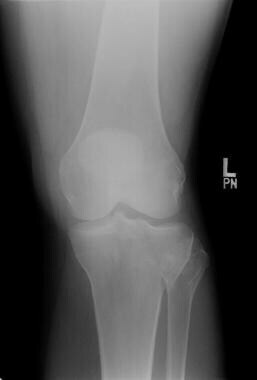 Radiograph of the knee shows lateral plateau splitting, a Schatzker I injury. There is no articular depression. Medial plateau injuries may result in fracture of the fibular head, which may injure the peroneal nerve or may be associated with popliteal artery occlusion. Patients may present with a knee effusion, pain, and joint stiffness. Finally, although severe fractures often are repaired surgically, both operatively and nonoperatively treated fractures are at risk of developing posttraumatic osteoarthritis as a result of ligamentous injuries with resultant instability, as well as articular discongruities, biomechanical alteration of normal compressive forces, and cartilage damage. The preferred examination consists of radiographs in multiple obliquities of the knee. 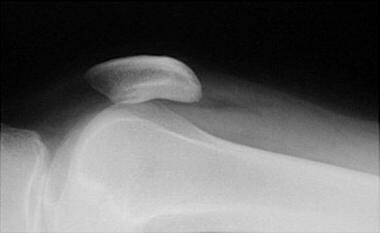 Typically, these include anteroposterior (AP), cross-table lateral, patellar (sunrise), and, possibly, oblique views. Cross-table lateral and AP may be the only views possible in the trauma suite. In this setting, the cross-table lateral radiograph may be the most important to detect occult fractures. The presence of these subtle fractures may be inferred by the presence of a lipohemarthrosis on the cross-table lateral radiograph, indicating disruption of an articular surface, most often the tibia. Nondepressed tibial plateau fractures occasionally are difficult to appreciate with standard radiographs. Cross-table lateral radiographs may demonstrate a lipohemarthrosis within the joint, with layering of bone marrow fat upon blood. If lipohemarthrosis is present, an intra-articular fracture is present and must be located. In this situation, axial CT is an excellent tool for defining fracture anatomy using reconstructed images in the sagittal and coronal planes.The images below demonstrate the radiographic, computed tomography (CT), and magnetic resonance imaging (MRI) appearance of lipohemarthrosis. Tibial plateau fractures. 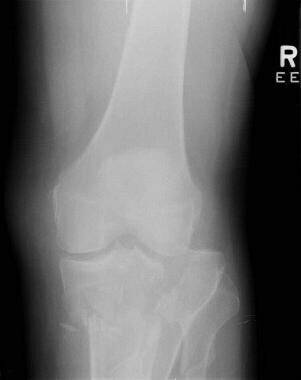 Cross-table lateral radiograph of the knee shows the lipohemarthrosis within the suprapatellar bursa. The fracture itself is not seen well. Tibial plateau fractures. 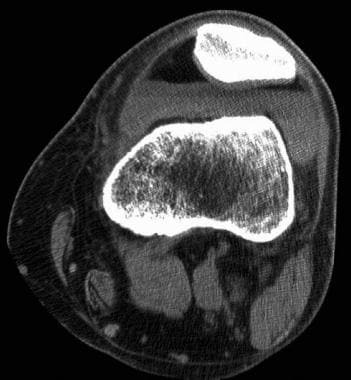 Axial CT image through the knee shows a layering lipohemarthrosis. Nuclear medicine studies are not used in the diagnosis of tibial plateau fractures unless a stress-type fracture is suspected or there is concern that osteomyelitis exists. Type IV fractures involving the medial tibial plateau raise concern that the popliteal artery has been injured. These arterial injuries can be clinically silent or present with decreased peripheral pulses. If clinical concern exists that a popliteal artery injury has occurred with any fracture type, obtain an arteriogram (or possibly an MR angiogram). Surgical manipulation of the tissues surrounding an injured popliteal artery can result in thrombosis, with dire consequences unless the thrombosis is addressed immediately. However, angiography is not used for the primary detection of tibial plateau fractures. Many methods have been developed to classify tibial plateau fractures, but all available classification systems for tibial plateau fractures are limited by their reliability and reproducibility. The Schatzker system has been found to have fair to substantial interobserver reliability. More sophisticated imaging modalities such as 2D and 3D CT typically improve reliability estimates. 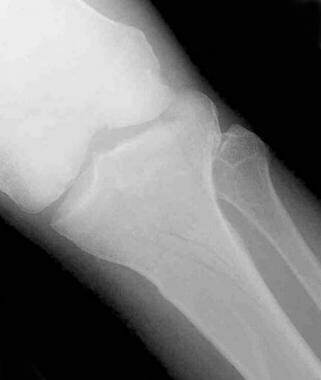 [13, 14, 15] Most fractures of the tibial plateau are diagnosed readily by conventional radiography. A false-negative radiograph may be encountered on the rare occasions in which a fracture is present but only a lipohemarthrosis is visualized. In these patients, CT or MRI is required to visualize the fracture. 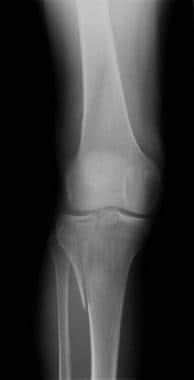 Type I fractures (demonstrated in image below) are split fractures of the lateral tibial plateau, usually in younger patients. No depression is seen at the articular surface. 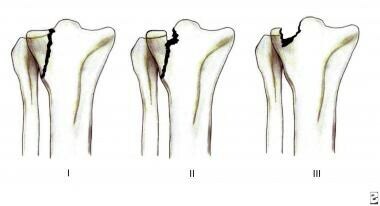 Type II fractures (shown in images below) are split fractures with depression of the lateral articular surface and typically are seen in older patients with osteoporosis. Tibial plateau fractures. 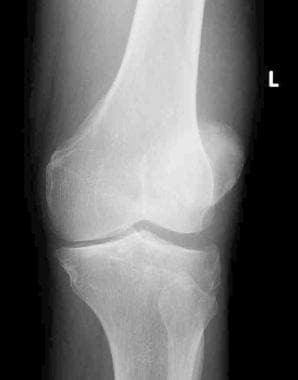 Radiograph of the knee shows a fracture through the lateral tibial plateau with extension to the lateral tibial margin and slight depression at the articular surface. This is a Schatzker II injury. Tibial plateau fractures. A different patient illustrates a Schatzker II injury with subtle lateral articular depression. Tibial plateau fractures. 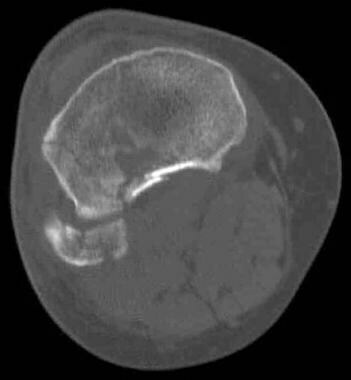 Axial CT image of the same patient as in the previous image shows the extent of the lateral tibial plateau fracture. In this case, it extends to the lateral tibial margin and an associated fibular head fracture is seen. This is a Schatzker II injury. Type III fractures (shown in image below) are characterized by depression of the lateral tibial plateau, without splitting through the articular surface. Tibial plateau fractures. 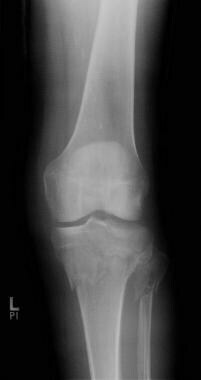 Oblique radiograph of the knee demonstrates a fracture of the lateral tibial plateau with slight depression. There is no associated wedge component. This is a Schatzker III injury. Type IV fractures involve the medial tibial plateau and may be split fractures with or without depression. Type V fractures are characterized by split fractures through both the medial and lateral tibial plateaus. 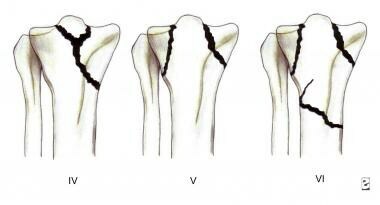 Type VI fractures (demonstrated in the images below) are the result of severe stress and result in dissociation of the tibial plateau region from the underlying diaphysis. Tibial plateau fractures. Radiograph of the knee reveals fractures through both the medial and the lateral tibial plateau along with a fibular head fracture and a fracture through the tibial metaphysis. This is a Schatzker VI injury. Tibial plateau fractures. Radiograph of the knee shows a different Schatzker VI fracture. 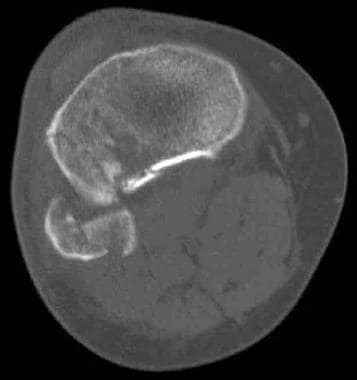 Although, as previously mentioned, most fractures of the tibial plateau are diagnosed readily by conventional radiography, CT often is used to confirm the anatomic relationship of fracture fragments with more complex fractures. This is especially true at the articular surface of the tibia, where precise 3-dimensional anatomy is critical to the success of surgical repair. Less comminuted and depressed fractures may not require imaging by CT.
False-negative errors with CT can occur when only axial imaging is used. 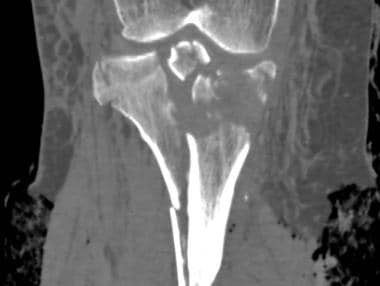 If a fracture predominates in the axial plane, it may be overlooked by CT. However, in most instances, sagittal and coronal reconstructions of axial data, as shown in the images below, are used to avoid this problem. By reconstructing the initial data set into different planes, additional information such as articular depression and diastasis may be obtained easily. False positives are not common with CT.
Tibial plateau fractures. Coronal reformatted CT. Initial narrow collimation axial CT data can be reconstructed into sagittal and coronal planes. This technique is useful to evaluate for fracture lines parallel to the axial imaging plane, degree of articular depression, and degree of diastasis between major fracture fragments. The best reconstructions are made when the initial data set consists of axial images of less than 2 mm thickness. In this particular case, an axial data set of 1 mm images was reconstructed into this coronal image demonstrating fractures of the tibial spines. MRI is very sensitive to the presence of osseous injury. Injuries to osseous structures manifest as areas of edema within bone marrow. However, fractures through the cortex are less well depicted, as cortical bone appears as an area of low signal (generally black) on MRI sequences. Thus, fractures through cortical bone can be difficult to depict with MRI. Complex and comminuted fractures with multiple cortical fragments are exceedingly difficult to analyze with MRI. False negatives with MRI are uncommon. MRI is used routinely for the detection of occult fracture because of its superior depiction of bone marrow edema, a direct indicator of osseous injury. False-negative information may result when MRI data are analyzed for the presence of cortical fractures. False-negative and false-positive errors may occur if the incorrect MRI sequences are chosen. In general, a fluid-sensitive sequence, such as short tau inversion recovery, rather than a simple T2-weighted sequence, is best to detect bone marrow edema. Wang Y, Cao F, Liu M, Wang J, Jia S. Incidence of Soft-Tissue Injuries in Patients with Posterolateral Tibial Plateau Fractures: A Retrospective Review from 2009 to 2014. J Knee Surg. 2016 Aug. 29 (6):451-7. [Medline]. Tang HC, Chen IJ, Yeh YC, Weng CJ, Chang SS, Chen AC, et al. Correlation of parameters on preoperative CT images with intra-articular soft-tissue injuries in acute tibial plateau fractures: A review of 132 patients receiving ARIF. Injury. 2017 Mar. 48 (3):745-750. [Medline]. Mattiassich G, Foltin E, Scheurecker G, Schneiderbauer A, Kröpfl A, Fischmeister M. Radiographic and clinical results after surgically treated tibial plateau fractures at three and twenty two years postsurgery. Int Orthop. 2014 Mar. 38 (3):587-94. [Medline]. Zhu Y, Yang G, Luo CF, Smith WR, Hu CF, Gao H, et al. Computed tomography-based Three-Column Classification in tibial plateau fractures: introduction of its utility and assessment of its reproducibility. J Trauma Acute Care Surg. 2012 Sep. 73(3):731-7. [Medline]. Yang G, Zhu Y, Luo C, Putnis S. Morphological characteristics of Schatzker type IV tibial plateau fractures: a computer tomography based study. Int Orthop. 2012 Nov. 36(11):2355-60. [Medline]. [Full Text]. Yang G, Zhai Q, Zhu Y, Sun H, Putnis S, Luo C. The incidence of posterior tibial plateau fracture: an investigation of 525 fractures by using a CT-based classification system. Arch Orthop Trauma Surg. 2013 Jul. 133(7):929-34. [Medline]. Zhai Q, Luo C, Zhu Y, Yao L, Hu C, Zeng B, et al. Morphological characteristics of split-depression fractures of the lateral tibial plateau (Schatzker type II): a computer-tomography-based study. Int Orthop. 2013 May. 37(5):911-7. [Medline]. [Full Text]. Piątkowski K, Kwiatkowski K, Piekarczyk P, Zegadło A, Rojkowski R. Comparative Analysis of Clinical Outcomes of Tibial Plateau Fractures and Computed Tomography Examinations. Ortop Traumatol Rehabil. 2015 Mar-Apr. 17 (2):135-45. [Medline]. Lee SY, Jee WH, Jung JY, Koh IJ, In Y, Kim JM. 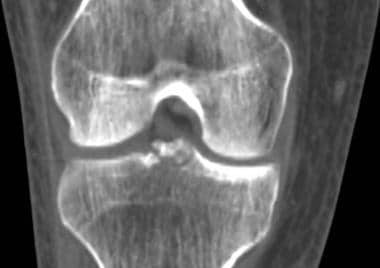 Lateral meniscocapsular separation in patients with tibial plateau fractures: detection with magnetic resonance imaging. J Comput Assist Tomogr. 2015 Mar-Apr. 39 (2):257-62. [Medline]. Xu Y, Li Q, Su P, Shen T, Zhu Y. MDCT and MRI for the diagnosis of complex fractures of the tibial plateau: A case control study. Exp Ther Med. 2014 Jan. 7 (1):199-203. [Medline]. Brunner A, Horisberger M, Ulmar B, Hoffmann A, Babst R. Classification systems for tibial plateau fractures; Does computed tomography scanning improve their reliability?. Injury. 2009 Sep 8. [Medline]. Mustonen AO, Koivikko MP, Kiuru MJ, Salo J, Koskinen SK. Postoperative MDCT of tibial plateau fractures. AJR Am J Roentgenol. 2009 Nov. 193(5):1354-60. [Medline]. Taşkesen A, Demirkale İ, Okkaoğlu MC, Özdemir M, Bilgili MG, Altay M. Intraobserver and interobserver reliability assessment of tibial plateau fracture classification systems. Eklem Hastalik Cerrahisi. 2017 Dec. 28 (3):177-81. [Medline]. [Full Text]. Mellema JJ, Doornberg JN, Molenaars RJ, Ring D, Kloen P, Traumaplatform Study Collaborative & Science of Variation Group. Interobserver reliability of the Schatzker and Luo classification systems for tibial plateau fractures. Injury. 2016 Apr. 47 (4):944-9. [Medline]. Millar SC, Arnold JB, Thewlis D, Fraysse F, Solomon LB. A systematic literature review of tibial plateau fractures: What classifications are used and how reliable and useful are they?. Injury. 2018 Mar. 49 (3):473-490. [Medline]. Redmond JM, Levy BA, Dajani KA, Cass JR, Cole PA. Detecting Vascular Injury in Lower-Extremity Orthopedic Trauma: The Role of CT Angiography. Orthopedics. 2008 Aug. 31(8):[Medline]. Kode L, Lieberman JM, Motta AO. Evaluation of tibial plateau fractures: efficacy of MR imaging compared with CT. AJR Am J Roentgenol. 1994 Jul. 163(1):141-7. [Medline]. Tibial plateau fractures. 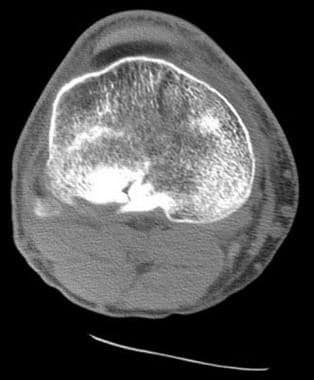 Axial CT image demonstrates the extensive fractures of both the lateral and medial aspects of the tibial plateau, a Schatzker VI injury. Steven Sorenson, MD, is gratefully acknowledged for this extensive contributions made to this topic.